You can’t tie knots in ropes that are frozen solid – and you can’t untie frozen knots that are already there #narrowboat #England – The Diesel-Electric Elephant Company. Things were a bit chilly this morning. When I picked up my centre-line it was frozen solid from one end to the other, it just sort of pivoted and didn’t even sag in the middle. Ropes that won’t bend present certain disadvantages, not only in the handling of them but in the fact that you can’t tie a knot in a solid “rod” of rope, and you can’t untie knots that were already there when the rope got wet and was then frozen. The Cardinal and I did eventually get moving though. A couple of hundred yards ahead to the service point for water, rubbish and gazunders, then immediately through Penkridge lock and onwards, just over eight miles and five locks. The Cardinal et moi dropped 43′ in locks, including two ‘orrible ones, one of 10′ 0″ drop and the last one of the day at 10’ 3″ drop. That’s a lot of wet ladder to climb to get back down to the boat. Motivated thus, I have a grip that is praeternatural, and I move one hand, one foot at a time, testing the new hold before I release an old one. I make more fuss about that final step off the ladder and onto the Cardinal than Armstrong made about stepping onto the Moon. It may be one small step for narrowboat man, but if you think that I’m going to take any giant leaps for mankind then you’ve got another think coming. 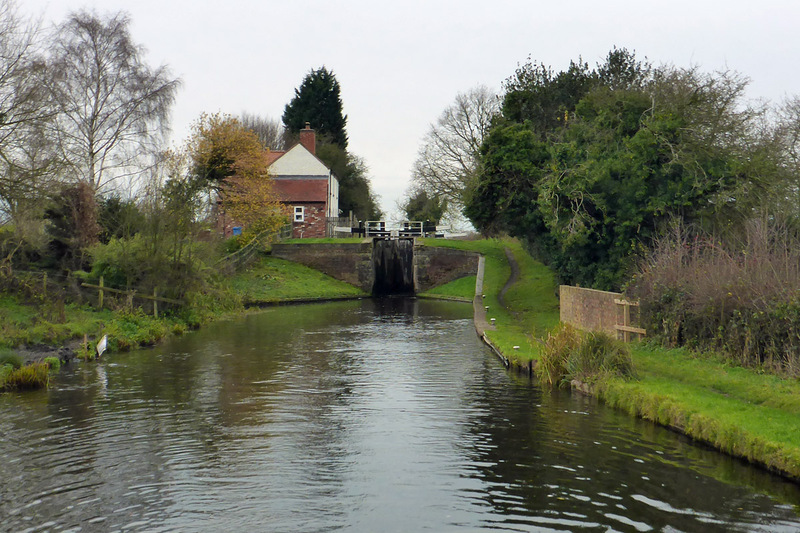 The photograph above was taken as we cruised away from the last lock of the day, Deptmore Lock, in all of its 10′ 3″ glory. At the start of the day I thought that I was going to be dogged by traffic. While I was at the service area a boat came up the lock, looking to turn and use the facilities, and after we’d swapped over and I was heading down in the lock there was another boat waiting to come up. After a couple of locks the first boat caught me up (the benefits of two crew to one), and I had visions of being chaste all the way – um, I mean chased all the way, but they dropped out of the race after just three locks. Peace reigned once more, and for the greater part of my cruise. This being England it all gets a bit awkward when folk meet in winter at locks, They feel obliged to assist, I feel obliged to return the favour, and we neither of us get anywhere faster than we otherwise would have. After you! No! After you! Either these locks are, like the previous batch, heavier to operate than they ought to be, or I’m not cooking on three Shredded Wheat. Somewhere under my svelte one-pack there has to be a beach-body six-pack by now, shy and hiding itself. I felt like an old donkey pushing some of the gates open, and I probably looked like one too. One or two of the paddles required both hands and a damned good grunt on the windlass. The Greek and Roman gods alone know what he’s tied his ropes to on that smooth concrete monolith. Superglue? From inflatable dingy to folding television aerial poked out into the sunlight, that’s his stuff on the towpath. He seemed happy enough. We couldn’t hear one another because of the noise but I shouted something along the lines of ‘Hello, splendid day for a cruise, what?’ and he smiled back and shouted something incomprehensible. There was just time for a wave and a couple of photographs. Moorings under the M6 Motorway, that shape in the “roof” to the centre left is a huge vent leading to the central reservation, letting even more traffic noise and rumble percolate down, and doubtless filth and fumes too. Yuck, I say, and thrice yuck. Perhaps what he was shouting was “Meteorite storm expected – take cover!” or something. I’m not sure that I could have stuck it under there for ten minutes, let alone the length of time that he looked to have been there. I am a troglodyte in intellect and outlook, not in nesting habit. Thus the Cardinal and I are out in the middle of nowhere tonight, surrounded by trees and screaming pheasants. At least, I hope that they are pheasants, screaming. We are though, near the main-line railway. I don’t mind the sound of trains, even Dickie Branson’s, and the advantage of mooring near a railway line is that they have interwebnet mobile signal repeaters at regular intervals… which is what is why I can post this online. This was also the first armco that I found. The ground is too soggy to trust ourselves to pins at this time of year. Tomorrow is forecast to be rain, rain and more rain, so whether I move on again to pastures more recommended depends upon the whim of the weather gods. I am trying to be somewhere respectable in order to meet the Fuel Boat again, the better to stock up on enough coal, diesel and LPG to see me through to time’s end. Moving also depends upon whether my back still bends in the morning, or whether it is as stiff as a frozen mooring rope. I cooked pasta for myself once I’d stopped moving. A nice, thick tomato sauce and lots and lots of olives. Quick to cook, easy to prepare and, with enough chilli and garlic and ground black pepper added, a good winter-warmer. The portion size was scandalous, but it’ll see me through until breakfast and that’s my excuse and I am sticking to it, rather like the way the pasta is sticking to me. So that’s been my day. Eight and a quarter (canal) miles from Penkridge, forty-three feet lower in altitude than we were, and full of pasta and olives. There’s mayhap fifteen miles and a dozen locks now to see us clear of this batch of “winter stoppages”, and the delights of Stoke on Trent and the Harecastle Tunnel loom large. Then about thirty more locks after that we’ll be back in old familiar, more simple territory and ready to test out the freshly-restored-unto-us Middlewich link, with its rinky dinky repaired breach. Cunning chap that I am, I am planning on arriving there after sufficient time for lots of other boats and boaters to have tested the repairs! If mutton can dress as lamb then there’s no reason why goose can’t disguise itself as swan. Forget the ’53 convertible and the duplex, how about heated mooring ropes? Ian H., Admiral (retired), and Cardinal Wolsey, narrowboat. Muntjac are about the only wild deer we have in England (that I know of) – used to see them regularly on my walks around Lincolnshire but haven’t spotted any yet on the canals, in spite of keeping my eyes out for them. Sheep a-plenty though, I wonder if lanolin would work as well? That’s something I’ll have to investigate seriously – for all over the boat! It’s not often that the ropes freeze quite so solidly, but these had been well soaked by torrential rain before the freeze hit – they were half rope, half ice! I think the winter posts ought to come with a statutory picture of Mr Stove for us readers to warm ourselves against; this made me shiver at the thought of climbing down all those wet ladders and putting the central heating full on. It also reminded me of when as a kid the only means of drying clothes was outside, on a day such as yesterday you would have to walk the clothes inside as they were too stiff to drop into a washing basket! Never did understand why my mother put then outside. No point intelling you to keep warm, but do take extra care on the ladders – locks mechanisms and ladders must freeze also I imagine. You need to boil some water to pour on your ropes. Surely it’s not so cold that boiled water will turn immediately into ice? Goodness this seems like a great deal of movement in the time of year one should be snuggling up with a book and a glass of something warming and not moving until AT LEAST March, possibly April. You have all of my sympathy and admiration. Also, in the future, DO NOT even exchange pleasantries with people who find it cozy to be under a highway as a home UNLESS they are homeless, which by definition of your circs, they are not. There is a homeless encampment below one of the downtown interchanges here and all I can think is that it must drive the poor things MAD. If you homeless, it does offer some deep advantages, but I think I might risk the weather to escape the noise and fumes. But your feller is just mad. Best to avert your eyes and pretend he doesn’t exist. Boiling water would work, if (when) things freeze up so comprehensibly again I’ll try that. Under a motorway did seem to be a very strange choice of mooring – especially given that my preference is for wide wide wide open! I did keep the boat moving, just in case he had wild, staring eyes (not that I would have been able to see them in the dark)! Oil the ropes with a can of WD40?